People have a deep longing to connect with one another. Extrovert, introvert, it doesn’t matter. We want other people in our lives in some way. We need community. But community does not come easy. We often struggle with adapting our schedules or our attitudes for other people. It’s necessarily inconvenient and regularly frustrating, yet we still want it. Its absence feels unnatural and unwelcomed, like something is missing. The first-time scripture speaks of something being “not good” is when God speaks of Adam’s lack of a companion. God provides for Adam a partner in Eve; man was no longer alone, and it was very good. Our earliest parents lived in that perfect community for quite some time, not just with each other, but with God too. As you likely know, sin entered the narrative and the community became damaged. Adam casts blame on his wife, telling God that the responsibility of the sin falls on Eve. Both husband and wife cover themselves because of their shame and ultimately, God removes them from their home in Eden. A once unbreakable community now becomes separated. Now, thousands of years after the Fall, we still long for that perfect community, and while we might see glimpses of it, we cannot remanufacture the beauty of its original design. Try as we might, we are bound to our sinful states—we say dumb things, hurt one another, and let people down. Not to mention, many of us have been “burned by the church,” hurt by pastors, youth leaders, or other Christian authority figures. I know I’ve had my fair share of pain at the hands of Christian leaders, and I also know I’m not alone. This failing at community can make Church life complicated. We can so easily just check out, and indeed, many people have. They’ve left communities because they’re so sure that the people will hurt them again if they let their guards down. We, like our ancient parents, hide parts of ourselves from one another, keeping ourselves hidden, but this solution doesn’t actually solve the problem. We still want the community. We still need it. We just don’t know where to find it. At the beginning of NBC’s The Good Place, Eleanor Shellstrop arrives at a sort of Heavenlike afterlife. She’s introduced to her “soulmate,” Chidi, as well as her new neighbor Tahani and her soulmate, whose name we later find out is Jason. 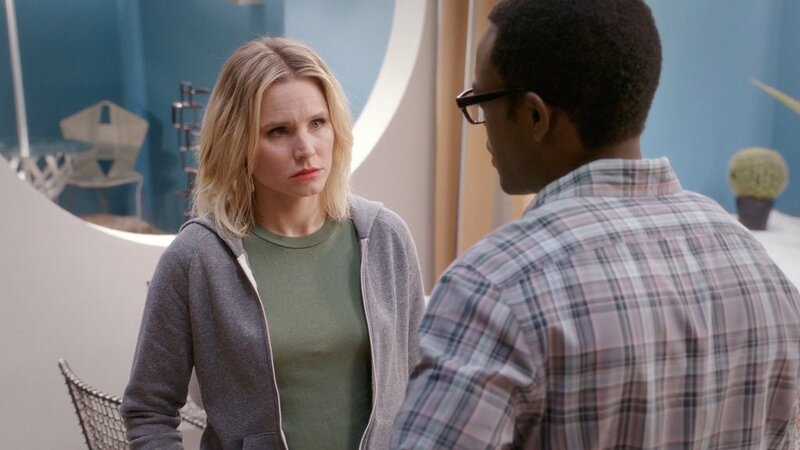 Quickly, Eleanor confesses that she doesn’t belong in “the Good Place” and someone must have made a mistake. Chaos ensue as audience members discover that each of the four main characters were hiding their true selves from one another and that none of them actually were meant for “the Good Place” after all. Once we look past the show’s theology of the afterlife, we can notice some really unique traits about the how the characters form a community despite being, quite literally, dead. Ultimately, these four characters have nothing in common: Chidi is an ethically focused philosophy professor. Jason is an amateur DJ with a comical criminal record. Tahani is an incredibly wealthy event’s organizer and philanthropist, and Eleanor is a self-proclaimed “Arizona Dirtbag” who sold fake pills to elderly people. Not exactly four people you’d seat next to each other at a dinner party. Interestingly, though, this is exactly why they were with one another. Viewers come to find out that “the good place” was actually an afterlife experiment put on by a demon to find new ways to torture people. He thought the four characters would frustrate one other so much that they would put themselves through worse torture than what hell had to offer. The four unlikely neighbors start to realize the scheme, and they band together to fight the evil forces. They become friends along the way, eventually even inviting the repentant demon into their little gang as he runs from the more powerful evil beings. Of course, this all can feel a bit too good to be true, but the only reason it feels impossible is because we don’t actually operate like that. Instead, we typically find people that look, sound, act, and think exactly like us and just stick around them. We don’t get forced into many situations with people we don’t like, and if we do, we just find ways to remove ourselves. The characters in The Good Place have no way out, and they show us the relationships that are possible when we just stick with the people that frustrate us. While this way of operating may seem too difficult or just flat out unnecessary, in its simplest form, it serves as a picture of living out Jesus’ command to “love your neighbor.” We don’t get to choose our neighbors: the family across the street with the loud music, the person at the desk next to ours who types too loud, or the guy in the small group who won’t stop talking. But we are united in that all these people are human just like us. Plus, each of us definitely have our own flaws and problems that make us less than ideal neighbors. Maybe I’m actually the guy who talks too much in small group.